Gluten free. Free from artificial colours, flavours & preservatives. 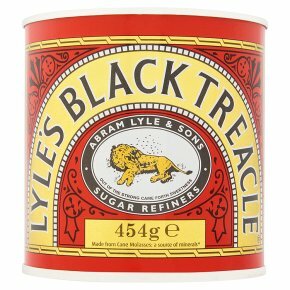 Suitable for vegetarians.Made from Cane Molasses: a source of minerals* *Typical mineral values Lyle's Black Treacle® adds a distinctive rich, dark flavour to traditional recipes like Christmas pudding, parkin, treacle toffee and gingerbread. It also tastes great in savoury foods, try it as a glaze for salmon.